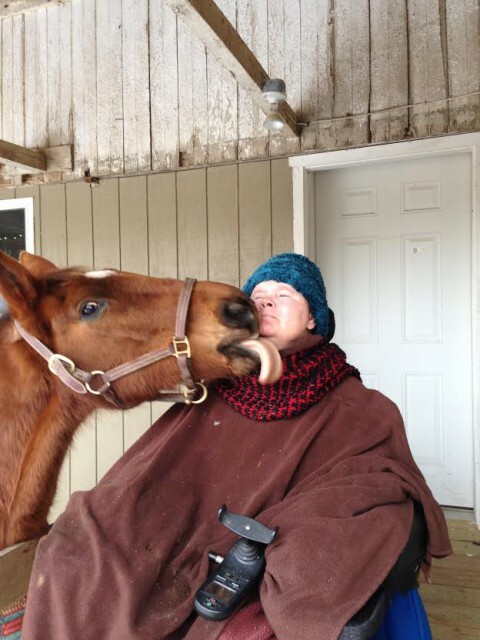 The Smoochin' Selfie winner: Christa Mays, who submitted this photo of Kim Meier and her horse Bart! Happy Valentines Day, EN! We hope you’re getting in some serious quality time with your horse today — we all know who makes the better Valentines date here! Earlier this week, we asked you to send in your “smoochin’ selfies” in honor of Valentine’s Day. We received well over 50 entries, and it was exceedingly difficult to come up with 10 finalists. We slipped an extra one in — Chinch is very bad at decision making — so we have 11 finalists to present for your vote. You all voted for your favorite over the weekend, and we’re pleased to announce the winner of the Smoochin’ Selfie contest: Christa Mays, who submitted this fantastic photo of Kim Meier and her horse Bart. Christa will receive an 8-pound bucket of Neigh-Lox Advanced from Kentucky Performance Products and a bucket full of other Kentucky Performance Products goodies. This may have been the closest vote in EN history, so congratulations, Christa!